Kumasi, June 20, GNA - Ghana's Black Stars played one of their best games in recent times to maul the national team of South Africa (Bafana Bafana) 3-0 in a World cup qualifying match at the Kuamsi Sports stadium on Sunday. For once, the Stars played like a team, were cohesive and fluid with their passes which gave them ball possession for most of the time to give Ghanaians hope that they were capable of qualifying for the World Cup. Coach Mariano Barreto played William Tierro at the midfield and justified his inclusion by playing one of his best games to the admiration of the crowd by combining effectively with skipper Stephen Appiah and Baffour Gyan to give the South African's a lot to worry about. The South Africans kicked off and earned a corner kick in the first minute but they wasted it and followed it up with a miss a minute later when George Koumantarakis shot sailed over the bar. The Black Stars countered immediately and sent the ball to Baffour Gyan who in an effort to trick the goalkeeper shot at the side netting. From the way the Stars were playing, it was obvious that they would not be denied a goal and it eventually came in the 13th minute from a Sulley Muntari's left foot of a shot. It was Dan Quaye who moved the ball from the centre and floated a pass that was deflected to unmarked Sulley Muntari on the left who shot first time to the far corner of the net for the expectant match opener. The goal brought a lot of bite into the game as the ball was moved from one side of the field to the other with the South Africans trying desperately to cope with the Black Stars attack. The South Africans however managed to contain the Stars and stepped up their game as they moved the ball into the Stars territory in the 31st minute. George Koumantarakis cut through the Stars defence and sent the ball into the goal area but Quaye was quick to come to the rescue as he scooped the ball off the goal line. The South Africans from then became a bit physical and in the 36th minute, Jacob Legehtho received the first yellow card for hacking down skipper Appiah. The Black Stars resumed the second half with even more vigour as they propelled the ball into the South African goal area and in the 49th minute, goalkeeper Moheeb Joseph fisted John Mensah's shot back into play. Skipper Stephen Appiah, who played a great game headed the ball over the bar from a free kick in the 51st minute. He was however not to be denied a goal as he scored Ghana's second goal in the 56th minute with a scissor kick from a Sulley Muntari pass. As the going got hotter, the South Africans made a change, sending in Elrio Vanheenden for Delron Buckley in the 60th minute while Ghana also made a change two minutes later, sending on Abubakari Yahuza for injured Muntari. The Stars surged forward as the crowd yearned for more goals but the South Africans held them at bay after replacing veteran Mark Fish with Rabelemase. However, the Stars were not to be denied a third goal as skipper Appiah initiated a move in the 78th minute from the midfield. 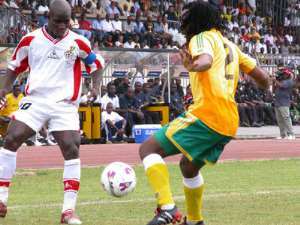 He laid on a pass to Baffour Gyan who instinctively put him through and the drove the ball past a bemused keeper Joseph. The Stars made two quick changes in the 79th minute and 85th minutes respectively bringing on Kwadwo Poku for Ibrahim Tanko while Charles Taylor replaced skipper Appiah. Taylor announced his presence on the stroke of full time with a tricky shot which hit the side net. With victory certain, the Stars resorted to short man-to-man passes teasing their opponents till the end of the game to break the South African dominance of the Ghanaians.